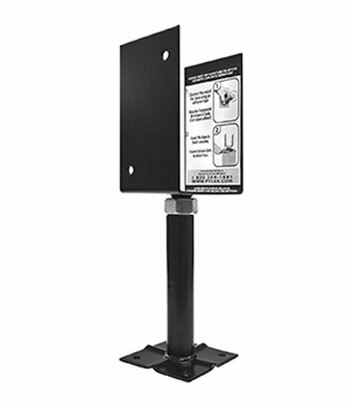 This Adjustable Post Base solidly supports and levels your deck. It facilitates the leveling of the floor during construction or its adjustment following ground movements (freezing, thawing, earthquake). A proven reliable and efficient solution! Steel fabrication provides 3 inches of easy height adjustment. Installed in a block or a concrete sonotube. Typically used with 4x4 square posts. Black color baked coating finish provides excellent rust resistance. Base To Bottom Of Beam Support, Down Position: ~ 6-5/8"
Base Adjustment: 3" (= 6-5/8 to 9-5/8" height from bottom to post underside, total to beam support.